V1675. 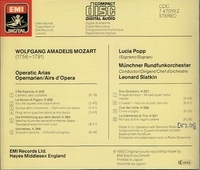 LUCIA POPP, w.Slatkin Cond. 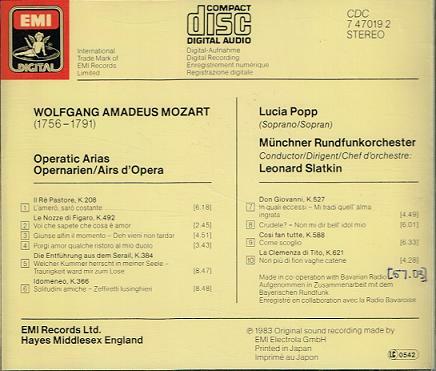 Münchner Rundfunkorchester: Mozart Operatic Arias. (Japan) EMI 47019, recorded 1983. Long out-of-print, Final ever-so-slightly used copy! 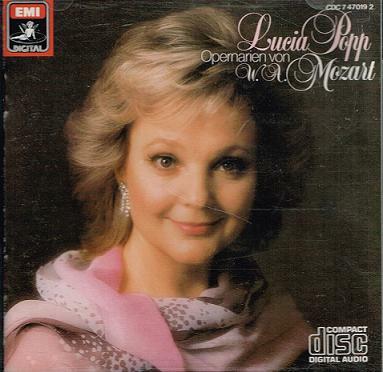 “Lucia Popp was an accomplished coloratura soprano in the early years of her career, but later she moved with great success into the lyric repertoire and, still later, into the lighter Strauss and Wagner operas. She had the ideal voice and personality for Viennese operetta, and was one of the best Rosalindes (DIE FLEDERMAUS) and Hanna Glawaris (THE MERRY WIDOW) of her time. She was also a celebrated recitalist and lieder singer, where her singing benefited from her charming stage presence. Her untimely death in 1993 cut short a major career. Popp initially entered the Bratislava Academy to study drama. Anna Hrusovska-Prosenkova, a voice teacher at the Academy, happened to hear her singing during a performance of Molière's LE BOURGEOIS GENTILHOMME, and offered her voice lessons. She began her studies as a mezzo-soprano, but her voice quite suddenly developed a high upper register -- so much so that her professional début was as Mozart's Queen of the Night at the Bratislava Opera. That role was to remain a staple for many years of her early career. Popp soon made débuts at the Theater an der Wien and the Vienna State Opera, where her first role was Barbarina in LE NOZZE DI FIGARO. She had strong ties to the Vienna State Opera during her career, though she left their regular roster in 1967, and in 1979 she was named an Austrian Kammersängerin. She made her Covent Garden début in 1966 as Oscar in UN BALLO IN MASCHERA, and her Met début in 1967 as the Queen of the Night.